I’ve picked up a few tips over the years on how the industry works and what the best ways to get started are. London has an amazing array of advertising, marketing, communications and public relations agencies. Strategist Walking into an offsite room with no brief and no idea why you are there. Then figuring out what is needed and how to communicate it. – You probably like venn diagrams and moleskine notebooks. Client services Walking into an onsite meeting room with someone you already know to catch up and update them on how things are going. Without getting into a fight over the colour of the logo. – You probably enjoy socialising and organising things. Copywriter Walking into a breakout room to brainstorm ideas and think about headlines. – You probably enjoy movies and critiquing other advertisements. Art director Walking into a breakout room to brainstorm ideas and think of ways for an advertisement to come to life. – You probably enjoy album covers and fonts. These are grossly over-simplified and ignore the tapestry of long-form copyrighting, graphic design, product design, illustration, animation, production, photography, web development and other careers within marketing and communications. It may be years before you get to specialise in one or other of these career tracks and you will probably start out as a general intern, account executive or graduate trainee. But knowing what path you are most interested in will make you much more credible in job interviews. If you have exhausted your savings waiting for a job in advertising or you are simply interested in what else is out there then you may be able to use your skills in unexpected ways. I started off as a lawyer and worked my way through management consulting (in the innovation and product design space) before working in brand design, public relations and now social media. Advertising isn’t the only place that a young creative could look for their first job. The social media channel model that I use in my upcoming book on B2B social media is also useful for understanding how marketing and communications agencies all fit together. The model was developed by Forrester research and classifies the basic ways that a brand can communicate with an audience in Paid, Owned and Earned media. Paid media is the traditional domain of the Advertising Agency. It’s being encroached on by design firms that create direct mail and digital advertisements. Paid media also being encroached on by PR agencies that do “activation” like stunts, events and ambush marketing. Owned media is the traditional domain of the Design Firm. It’s being encroached on by advertising agencies that want to do brand design work. Owned media is also being encroached on by PR agencies that provide digital campaigns and advice on building a brand reputation. Earned media is the traditional domain of the Public Relations Consultancies. It’s being encroached on by advertising agencies who are creating integrated campaigns with sampling and word-of-mouth elements. Earned media is also being encroached on by design firms who are creating branded communities. All of these types of agencies are looking for creative talent. You might find a hot consumer PR agency that needs creative talent. They call all their jobs “Account Executive” or “Account Manager” but don’t be put off, it could still be a creative role. Or you might find a digital design firm that needs some creative energy in their direct mail department. It’s not glamorous but it’s rock solid experience. Who has recently been bought by WPP or Omnicom? These two global advertising powerhouses specialise in finding and buying interesting agencies. 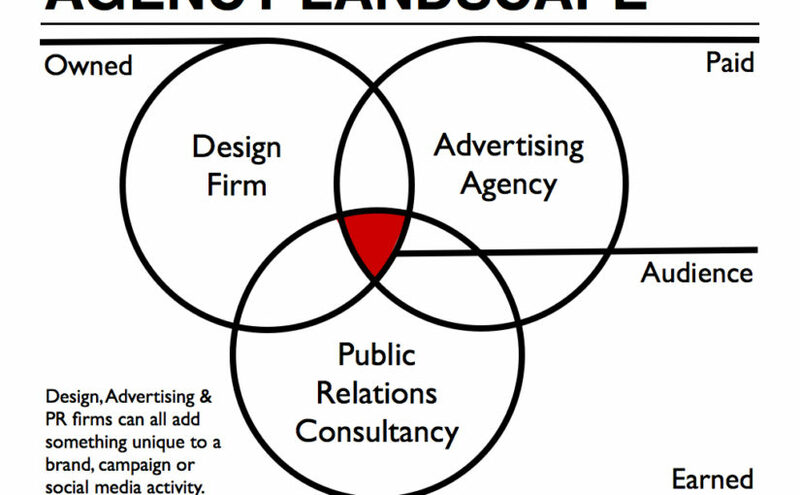 If you can find design firms and PR agencies have been bought out by WPP or Omnicom then it’s probably because they were becoming a threat to the ad agencies. Where are the top talent from big ad agencies going when they leave? Lots of them are going in-house for tech companies like Facebook, Google and Amazon. Maybe there is more creativity going on there than you realised? A creative in a creative agency? Many of the young creatives that I meet are still fixated on the traditional hot shops, the Creative Agencies. The core of a creative agency is the task of thinking up new ideas for advertisements. If you grew up wanting to work in advertising, you were probably picturing a creative agency. If you’re finding the creative agencies tough to get a job in, but want to stay in the advertising space then you could broaden your search within the advertising industry by looking at innovation agencies, production houses and media agencies. As the power balances in the advertising industry changes, these other agencies are picking up more core creative work. For example, the media agencies are doing more and more interesting creative work. With so many places that you could put an ad, the simple act of choosing where to advertise and how to target a demographic is becoming a creative act in itself. 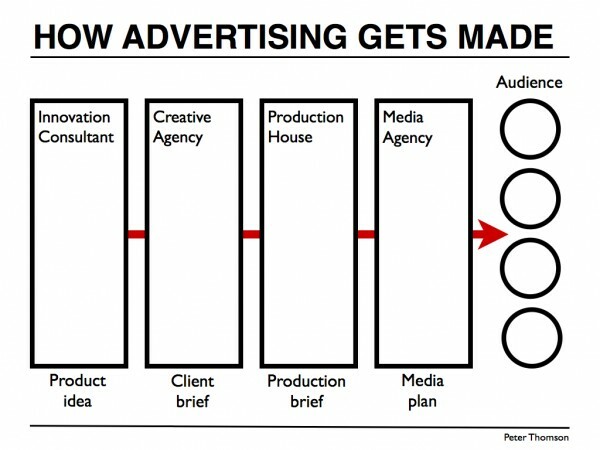 The traditional model of how advertising gets made is changing and evolving. If you really do want to work in a creative agency (as an actual “creative”) then find yourself a strong creative partner and get to work hustling. The traditional art director and copyrighter pairing is breaking down but it’s still the way the agency world works. Finding a creative partner is a bit like dating so take your time and make sure that you meet lots of people before you settle down. You will have to freelance, do speculative example work to build your portfolio, do work placements and get out there to meet as many working creatives as you can. Go to events, conferences and meetups regularly, work hard on your portfolio and keep pushing. The best resource that I’ve seen for this journey is the Australian advertising industry website Junior – Celebrating Life at the Bottom. You can apply creativity to almost any job if you think laterally enough. The marketing and communications industries provide excellent opportunities, but in the current economic climate you might have to think creatively about other ways into the industry. Your skills could be used in-house at a startup or within a technology company. Note: If you already have a job in marketing, advertising, design or PR then what would your top piece of advice be for young aspiring creatives graduating this year? Great advice. Also for aspiring creatives who still want to get into traditional agencies I’d say actually you have better chances than others (midweights / seniors). There’s been a big move to employ cheap talent at the bottom and only having a few people at the top in a creative department. Sure, you might have to intern and work for free for up to a year (just being realistic here) but at least at the end of it you can get a job, etc, in a good shop. Best of luck. Advertising is a hard road at any age. It seems that their is an increasing supply without an increasing demand. The “hollowing out” in the middle of agencies is a problem for lots of industries. Even lawyers, accountants and doctors are finding that their is demand at the top and bottom of the professions but the middle has become very static. Great post. 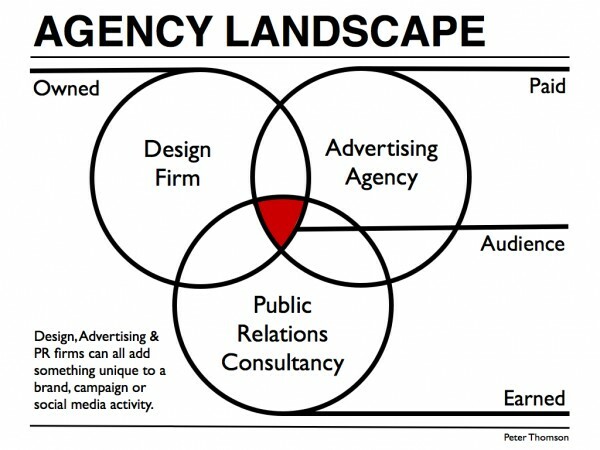 I love the diagram showing the inter-agency relationship, particularly the distinction between owned, paid and earned. Thanks Phil. This distinction is so obvious to social media professionals because we live at the overlap between paid, owned and earned. But for many advertising students it’s genuinely news that there are other ways to tell a story and engage an audience.